Now, I know what people say about keeping cats indoors when you move house, and the advice I’ve read online suggests a confinement period of anything from 1 week to 1 month. However, yesterday we opened the patio doors and gave Louis Catorze a bit of supervised time outside despite originally saying we wouldn’t do it until at least 14 days in. My main reason was to give the poor little sod a bit of time out of the dust; the night before last he woke us up a couple of times doing his horrible itch-yelp combination, and, trust me, if you heard your cat make that sound, you’d want to let them out, too. Plus I know every crease and fold of my boy’s face and I know that, when the inside corners of his eyes start to redden and look leathery and thick, it’s because they’re swelling up. Sometimes you have to throw away the Rule Book and just do what you feel is right for your cat. And I really thought some fresh air was what he needed. So his foray into the new jardin consisted of him racing out and flopping onto the garden path about 2 metres from the door. 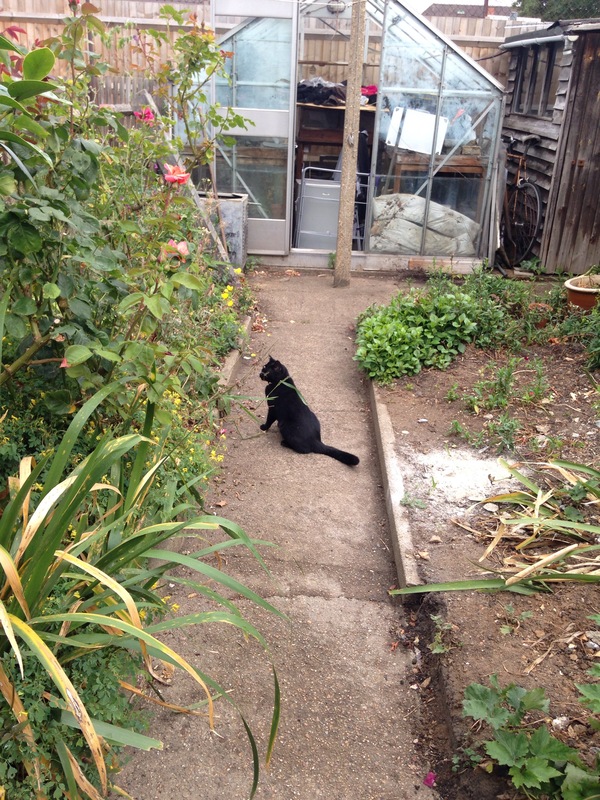 Then he got up and sniffed a few plants. Then he went into the greenhouse and fell asleep in the grossest, dustiest corner, with cobwebs hanging from above and trailing across his body. The End. What a week it’s been at Le Château. We’ve been up every morning for work, and at 7:30 on Saturday mornings before the decorators arrive at 7:45 (although Louis Catorze tends to alert us to their arrival with his indignant “Invaders dans mon château!” meow). The dust is really starting to get to us, with clouds of it rising from our clothes when we get dressed, and we’re suffering with itchy eyes and sore throats living in it all. Trying to wipe it away only seems to whip up swirling twisters of it and, even if we manage to clean it away one day, it’s back the next. The least awful of all the rooms is the attic bedroom, so that’s where we shut him whilst we’re at work, with the windows open a tiny bit and his litter tray in the en suite bathroom (well, he is a king). We keep a dust mite controller whirring away in that room, and I’d also have beeswax candles burning if I didn’t know that the stupid twit would knock them over and burn the place down. The bed in the attic room contains brand new anti-allergy pillows, duvet and mattress cover, so not a pesky feather in sight (see picture above). So far, so good: he’s deteriorated very slightly but he’s not looking TOO bad. I did briefly consider not letting him out of that room at all until the renovations are done, but he loves time with us and enjoys gadding about Le Château looking at things. I can only put his positive temperament down to the fact that we’re with him, whereas in the past a new home has also meant new people. Let’s hope he’s still as chirpy when training for Le Tunnel starts next week. Louis Catorze’s remedy from the bioenergetics company arrived just before the move but, along with a lot of other stuff, it’s trapped among boxes in the living room and I can’t get to it. Luckily he’s doing really well at the moment, both physically and in spirit, so I haven’t needed it desperately. The analysis that accompanied it was like a foreign language to me, as was the letter explaining it. The one bit that I did understand, however, was: “Please allow 4-5 working days before calling us to discuss the readings”, so presumably I’m not the only one. 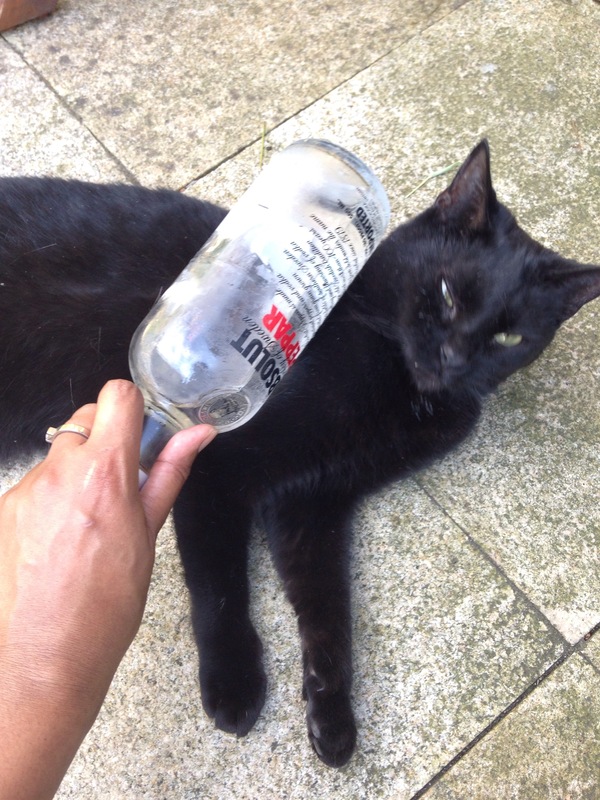 I called them today, and it seems that my cat defies both conventional AND alternative medicine: once again, he displayed sensitivity to certain substances, but not strongly enough to be causing such extreme symptoms. The bioenergetics lady said she couldn’t understand it at all. So Louis Catorze is a weirdo on many levels (although we kind of suspected this anyway). The bioenergetics lady also confirmed receipt of my emails containing his medical history and the dreaded photos which I once swore I would never show to another living soul: the ones taken in January 2014 by Louis Catorze’s then-foster mamma, which show his allergy at its absolute worst. I had warned the bioenergetics lady beforehand that these photos were upsetting viewing, thinking that, as a professional who dealt regularly with this kind of thing, she’d have seen much worse. Unfortunately her response was: “Quite shocking.” Oh dear. So I now need to get a move on in terms of clearing all those boxes and locating his stuff, so that I can start giving him the remedy. I also spoke to the vet at the ex-rescue centre, who told me that they would be able to do the skin scraping test at the same time as the vaccination. Louis Catorze is not due there until mid-August, so he will have a good few weeks to settle into Le Château before being disrupted again. Poor thing probably has many more mountains to climb until he’s fully better, but it’s really good to feel that things are moving and that we’re taking active steps to find that solution. 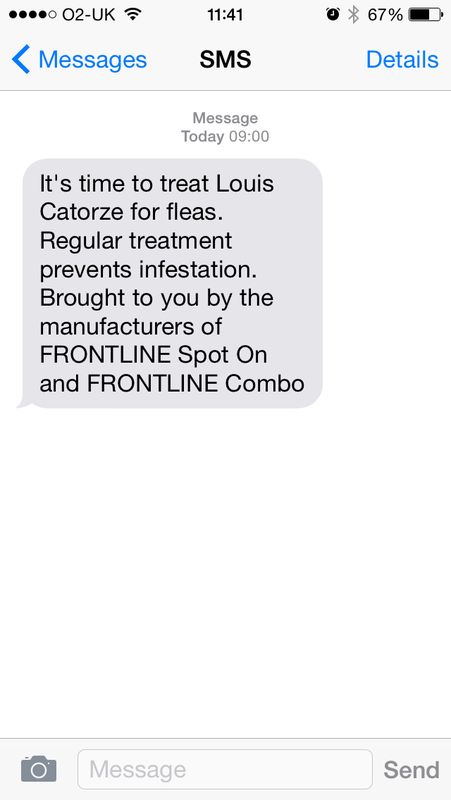 A text reminder to give Louis Catorze his flea treatment is only really helpful if you know where the treatment is. In fact, I have no idea where the vast majority of our stuff is. “Somewhere in the floor-to-ceiling jungle of cardboard boxes” is as good a guess as I can manage. So my second piece of advice to anyone moving a cat, after “Build the house first”, is: Put all the cat’s stuff into the removal lorry first, even if you are moving the cat last. We thought we had been very clever, packing all his things together and keeping them till last when we moved “so that nothing gets lost”. However, the problem is that it gets put on the lorry last, but unloaded at the other end first. Then it gets boxed into a corner by all the other stuff that comes after it. 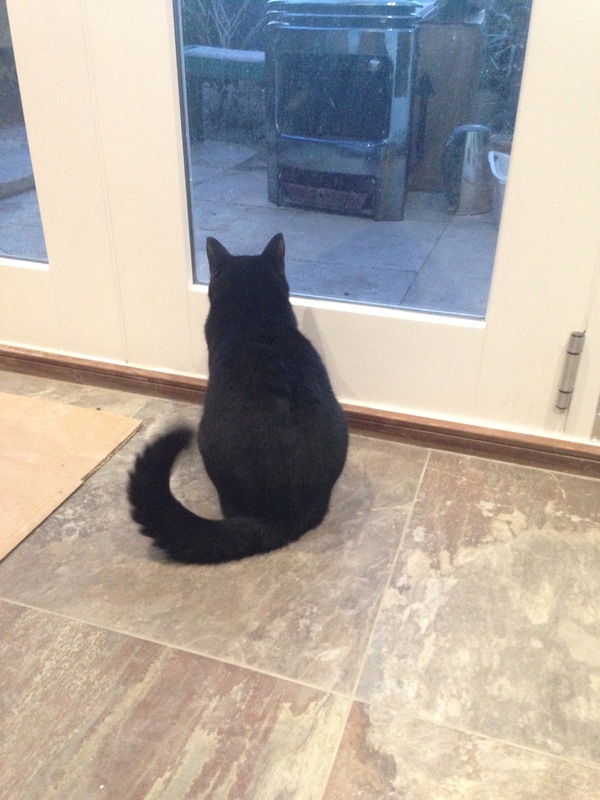 Yesterday we had to drag our very hungover selves to Pets At Home painfully early in the morning when we realised we couldn’t find Louis Catorze’s food – although, when we got home, the little sod refused to eat it – and now it looks as if we’re due another visit for his Advocate. His Atopica and Piriton were packed in the same place, as were the dust mite repelling devices and the anti-allergy beeswax candles, all of which we could really do with right now. Oh dear. They say that moving house is the most stressful experience the human body can endure without actually losing consciousness, or something like that, but they – whoever “they” are – have clearly never moved with Louis Catorze. After The Vet Incident, of which the poor veterinary staff now only speak in hushed whispers, I had expected nothing short of Armageddon for something as drastic as a house move: skies darkening, ravens circling, the lot. However, on the morning of the move, Louis Catorze was perfectly relaxed and happy, treating the cardboard boxes as his new gym rather than something to be feared. And, when the removal men turned out to be Crazy Cat Men, that was just about the glaçage on the gâteau. They couldn’t have been nicer to Louis Catorze, cuddling him and having him purr and nuzzle them, after which he seemed to think, “Now that we’re friends, I don’t mind what you do in ma maison.” So they were able to stomp and make noise with reckless abandon, and he was absolutely fine with it all: no upset, no yowling, nothing. 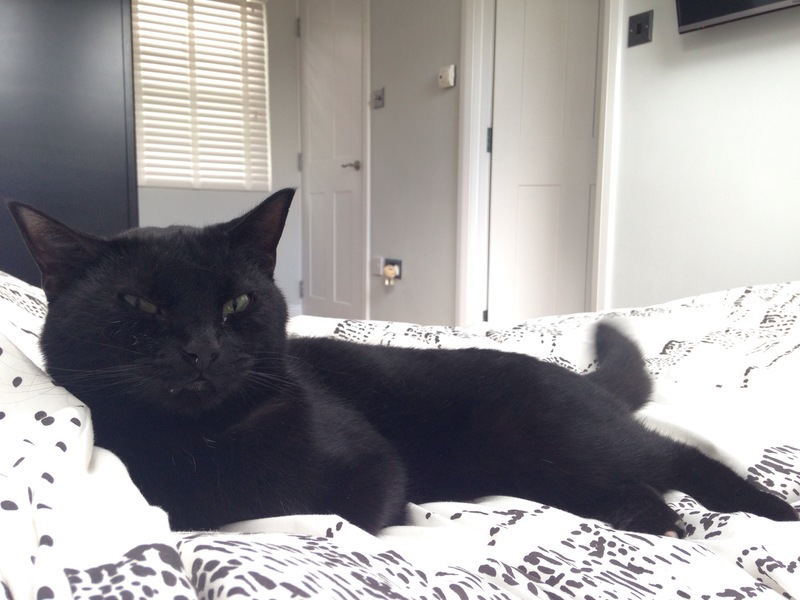 These guys don’t advertise themselves as a cat-friendly service – although they probably should – but, if you’re moving to or from the TW8 area and you want to make sure your cat is ok, look up Goddard’s of Brentford and ask for Dave and Matt to move you. 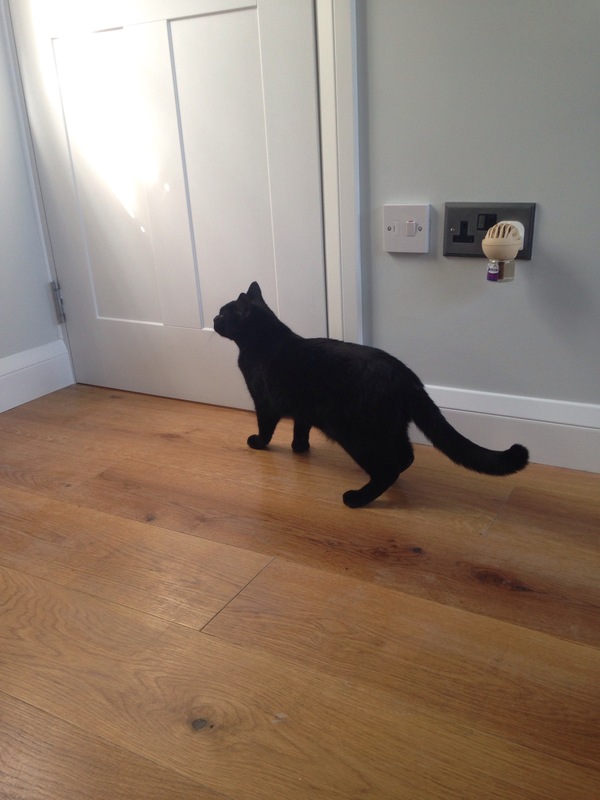 My no.1 piece of advice to anyone moving a cat would be to move them into a house that’s finished. Le Château-sur-Tamise isn’t even close to being ready so there was a lot of shunting Louis Catorze from room to room to create access for builders and, whilst he didn’t mind the builders themselves nor their noise, I think he could have done without the shunting around. His demeanour changed considerably at this point and out came the sad meows, the mega-sulks and the refusal to move from La Cage. Luckily he cheered up immensely by the evening and, after spending the night snuggled up at our feet and then waking us at 7am by puking on the floor, normal service had very much resumed. Unfortunately the work will be going on for a good couple of weeks, so we’re going to have to shut Louis Catorze in one room when we go to work and release him when the builders have packed up for the day. Not ideal, but there’s nothing whatsoever we can do about it – and it beats the alternative, which is Louis Catorze absconding through an opening somewhere and heading across the park and towards the main road. As a cat who has had a few different homes, I’m not sure whether Louis Catorze will respond to all this by thinking, “Oh merde, not this again,” or “I’ve done this before, and it was fine” (assuming he remembers, of course). I really hope it will be the latter, and that he will settle into his new Château quickly. I often say that I prefer excess cold to excess heat; when you’re too cold, there are measures you can take which will warm you up whereas, when you’re too hot, nothing whatsoever cools you. Today has proven that I was right all along, although being right doesn’t help in the slightest and, in fact, just annoys me more. That said, it can’t be much fun being a black, fur-covered animal in these record-breaking temperatures, either; poor Louis Catorze has spent the last day or two shunning all close physical contact, preferring instead to flop languidly around the house like a limp feather boa. At times his body seems to almost liquefy and seep into the floor and, although it’s quite funny to watch, I do feel sorry for the poor sausage. Luckily I don’t have to worry too much about him becoming dehydrated in the heat; even in moderately warm weather he drinks up to 1/3 of a pint of water a day, and I know this because he drinks from a glass and not a bowl. We were told about this strange quirk when we adopted him, and we thought at the time, “That’s absurd – he WILL drink from a bowl when he gets thirsty enough, because we will give him no choice.” No. He would rather shrivel up and die of thirst than be so vulgaire. And he won’t settle for any old glass, either: he will accept a pint glass or a wine glass, but not a cocktail glass nor a tankard. Figure THAT out if you can. 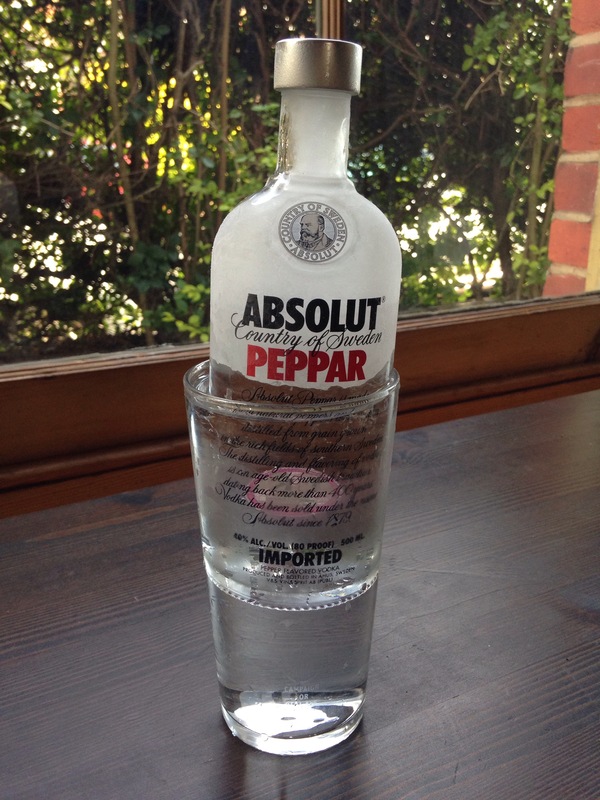 So, whilst there’s no doubt that he’s suffering in his perma-fur coat, at least he has his butler on hand to chill both the royal pint glass AND the royal person using a freezer-fresh bottle of Absolut Peppar. Let’s hope temperatures start to drop soon.